Personalized gifts are our favorite kind of gifts for the holidays. It shows that you've put extra thought into creating the perfect present for someone special. One of our all-time favorite places to find these is Thirty-One Gifts because their items are fun, functional and have a high-end look. You can select from a variety of patterns, embroidery font styles and thread colors to customize as you see fit. This year we're recommending the stylish yet practical Fold-Over Weekender Bag, great for travel, the gym or day outings with the kids! The Fold-Over Weekender Bag is made of a durable canvas that comes in a variety of trendy patterns. We love the Parisian Garden pattern that Thirty-One Gifts offers and chose a light blue embroidery thread to personalize it with initials. Aside from the beautiful design, this bag is comfortable to carry using the detachable strap or side handles and offers a great deal of space inside. It measures approximately 19.25” H (unfolded) x 18.75” L (top opening width) x 9.5”D. 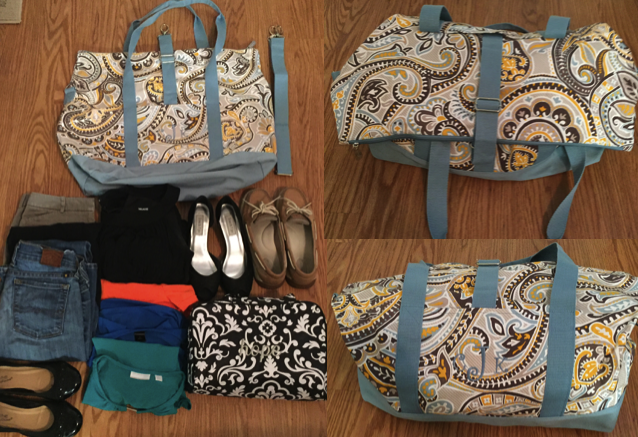 I took a snapshot of what I packed for a weekend trip to give you an idea of how roomy it is. Two outfits, a little black dress, two pairs of shoes, pajamas and my toiletries bag fit with plenty of room to spare! If you're looking to create a nice gift set, many of the same patterns offered with the Fold-Over Weekender bag are also offered in other items. For example, you may want to pair this bag with the the Glamour Case, Swap It Pocket and Perfect Cents Wallet. There are so many items and patterns to choose from that you can get as creative as you want in assembling a themed gift. Browse the catalog here. Thirty-One Gifts was founded on the principle of empowering women and works with charities such as Girl Talk and Ronald McDonald House (which is one of our favorite charities). In fact, they give back 5% of every sale to nonprofits that support women, girls and families. It's always an added bonus to know that your purchase helps support worthy causes!